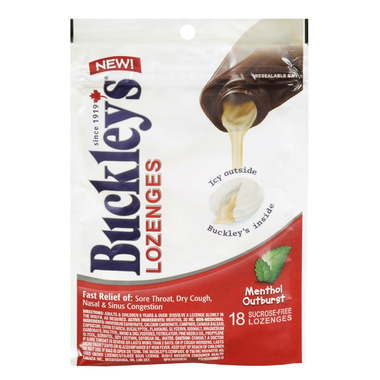 Buckley's Lozenges provide fast relief of: Sore Throat, Dry Cough, Nasal & Sinus Congestion. Icy outside, Buckley's inside! Directions: Adults and children 6 years and over: Dissolve a lozenge slowly in the mouth, as required. Children under 6: Do not use. Non-Medicinal Ingredients: Ammonium carbonate, calcium carbonate, camphor, Canada balsam, capsicum, corn starch, eucalyptol, flavours, glycerin, isomalt, magnesium carbonate, maltitol, mono & diglycerides, petrolatum, pine needle oil, propylene glycol, sorbitol, soy lecithin, soybean oil, water. Caution: Consult a doctor if sore throat is severe or lasts more than 2 days; or if cough worsens, lasts more than 7 days or is accompanied by high fever. Keep out of reach of children. Do not use if bag is open or torn. My husband uses these for nasal congestion and he says they work well and quickly but he prefers Fisherman's Friends just a little more.